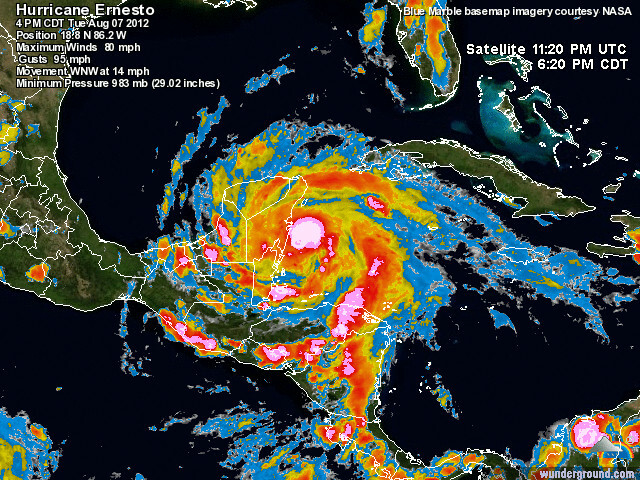 As we predicted, Ernesto took a route south of Yucatan State on Wednesday. The satellite fotos provided reliable data for us to make the estimates. As predicted, in Merida, we had some rain starting at about 11:30 AM Tuesday and continued sporadically until about 4 PM, our winds did kick up at 11 PM Tuesday night, followed by light rain through the night until about 8 AM Wednesday. We had cloud cover throughout Wed, but no daytime rain, and had sunny skies after 4:00 PM. Ernesto did strengthen as the center reached the Bay of Campeche, and it is predicted to continue to strengthen until about 11 AM Thursday (today). It still packs a punch with heavy rains and 45-75 mph winds near the coast, diminishing to 45 mph inland. The center should move WSW across Mexico, and move into the Pacific exiting Guerro by about 9 AM Friday. This means rain for Vera Cruz and Tabasco can continue until Friday AM. As predicted, the storm center has strengthened into a Cat 1 hurricane, with a small central core of 80 mph Maximum velocity winds, and gusts to 100 mph. This core area of hurricane strength winds is at most only 40 miles across ~ aimed a little north of Mahaul. The surrounding area of Tropical Storm force winds between 40-73 mph, is only 200 miles wide (ranging from Cozumel to about 1/3 of the way down Belize). Ernesto will lose a lot of strength as it moves over land, so, Merida and Progresso should only experience 30-60 mph winds. Based on Ernesto’s current speed, some rains should start at about 11 PM Central time tonight for Merida and Progreso, and come through the night for 6-8 hours until about 6-8 AM Wed. morning. The most recent satellite foto shows that Ernesto has weakened substantially on it’s northern flanks, so we may not see heavy storm conditions here in the northern Yucatan. Since Ernesto is a fairly disorganized storm with only a relatively small center, then it is spinning out arms of rain storms like a big pinwheel, with areas of only weak clouds between the arms. This will make for intermittent rain storms passing over Merida and Progreso through Wednesday, as the bands of storms pass overhead, followed by the gaps of low intensity clouds. The color satellite map on Weather Underground tells the whole picture. Check out where the white dot in the center will make landfall on Q.Roo’s coast. Tropical Storm Ernesto continues have max winds below a Category 1 Hurricane. Currently at 65 mph Max winds with gusts to 75 mph, it still struggles to get organized. Ernesto continues tracking more northward since Sunday, with just one out of the 5 computer models’ showing a center-of-storm path skewing about halfway up Yucatan State. We have had light cloud cover from Ernesto throughout Monday evening. The current projections show: Ernesto’s center should pass due south of Merida at around noon Wednesday. As a relatively diffuse (not compact, not highly organized) storm, we might see rains around Tuesday noon – 3 (if the modest intensity spots that are now hitting Cuba, instead shift westward onto us in Merida/Progreso), with increasing rain probabilities through Wednesday. The 12:30 AM Central Time Tuesday satellite foto map shows one heavy rain cell hitting Belice’s central coast right now, and light rain in Chetumal. The Mex. Gob. and Belize Govt. have issued Hurricane Warnings for all coastal points south of Punta Allen on the Costa Maya of Q. Roo. The storm center is projected to exit the Yucatan Peninsula by roughly 4 PM Wednesday, so, people planning car travel across Hwy 180 in Tabasco might want to scoot across before the heavy rains come. People traveling from Vera Cruz to Yucatan may want to consider taking the more inland route through Escarcega – since the area around Paraiso is not much of a paraiso during heavy rains. Tropical Storm Ernesto has been gaining strength today. At 4 PM Monday, Ernesto has 65 mph sustained winds with gusts up to 75 mph. It’s current most likely path takes the storm center south of Yucatan State, with the computer models of the center-of-storm paths converging on Chetumal, Quintana Roo, with the center of the storm making landfall at 2 AM Wednesday. This likely means rain, rain, rain for Merida / Progreso on Wed – Fri. Ernesto should pop out into the Bay of Campeche and if it regains strength after moving off-shore, it could dump a lot of rain on Campeche, Tabasco, and Vera Cruz later this week. If Ernesto gains strength (as expected) in the Gulf of Mexico, then people planning car travel later this week across Tabasco or Vera Cruz may find some roads washed out where they cross arroyos. Tropical Storm Ernesto has been gaining strength today. At 4 PM Monday, Ernesto has 65 mph sustained winds with gusts up to 75 mph. It’s current most likely path takes the storm center south of Yucatan State, with the computer models converging on Chetumal, Quintana Roo, with the center of the storm making landfall at 2 AM Wednesday. A quick glance at the 6 different computer models for storm center paths show that they diverge notably on Monday, so, the best educated guess at this time is that the storm center is likely tracking south of Merida, and that we really will not have a good estimate of its path until Monday. The Saturday plot makes it look like the storm center will run smack dab through Merida, right? Actually, the NWS maps have shown a variety of LIKELY paths for the center of the storm. And if you look closely at the Saturday Ernesto prediction map, the lines shown are for possible paths for the CENTER of the storm – where the expanding cone is just a range showing the likely paths. It is NOT a cone where the center is most likely path. which is 100’s of miles south of Quintana Roo or Yucatan. 2. A northern path that takes the storm center through Western Cuba, again, 100’s of miles from Yucatan. 3. A variety of central paths, none of which are predicted to swing north through Yucatan. If one makes a simple numerical average of the 6 major models, you get a MATHEMATICAL AVERAGE storm path through Yucatan, but that mathematical average is not based on any actual weather or meterological conditions, but is an numerical artifact of averaging 6 very different data sets. Based on the prevailing wind patterns and the water temperatures in the Bay of Honduras, we will really not be able to accurately estimate the storm’s path until Monday morning. The best current data show that Ernesto’s general storm center path will not be apparent until the 2 AM Monday morning and 2 PM Monday afternoon data. This means that on Monday, we will be able to see if Ernesto tracks across Southern Belize – completely missing us, ~ or whether it takes a central path which would likely give us heavy rains predicted with only Tropicak Storm force winds ~ or whether it will take a Northern path towards Cuba. Since there is a lot of guess-work in predicting actual hurricane and Tropical Storm paths, it is good to be prepared, but 100 years of historical weather data and the current Bay of Honduras temperatures indicate that Ernesto will likely only be at Tropical Storm levels (40 mph – 73 mph winds) as it makes landfall, especially if it takes a central or southern route. 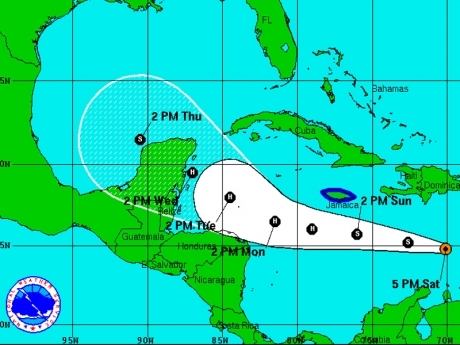 Keep an eye on http://www.wunderground.com/tropical/tracking/at201205_model.html maps to see how this one plays out. Please Continue to Make Comments and Replies to Help Keep This Information Current! Disclaimer: This information is not meant as legal advice. It is for educational and informational purposes only. Tropical storm paths in the Caribbean are inherently unpredictable and vary between storms, so, your personal experiences may vary. See a professional for advice on important issues.